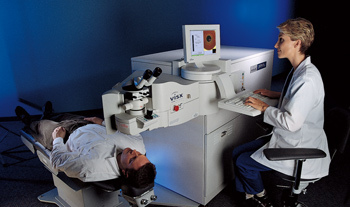 VISX designs and delivers individualized laser eye corrections with greater flexibility and precision than ever—while maximizing practice efficiency and patient flow. 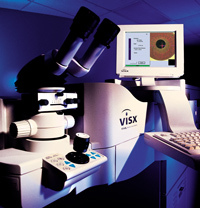 Inside each VISX Refractive Laser System is a laser, an optical delivery system, and a control system. After the laser beam is generated, it is shaped by moveable optical elements, and it is steered by a movable lens. The moveable optical elements, and the movable lens are controlled by six precision servo motors. The lens that steers the beam is controlled by two of the six precision servo motors attached to the laser beam steering mechanism. The movable optical elements and the laser beam steering mechanism utilize precision encoders for position feedback. The SynqNet motion controller is then responsible for laser beam shaping and steering in the process. * Visx is a registered trademark of Visx Technologies. All Rights Reserved.